The 2012 season saw Formula One racing return to the United States for the first time since 2007 with an all-new venue in Austin, Texas. 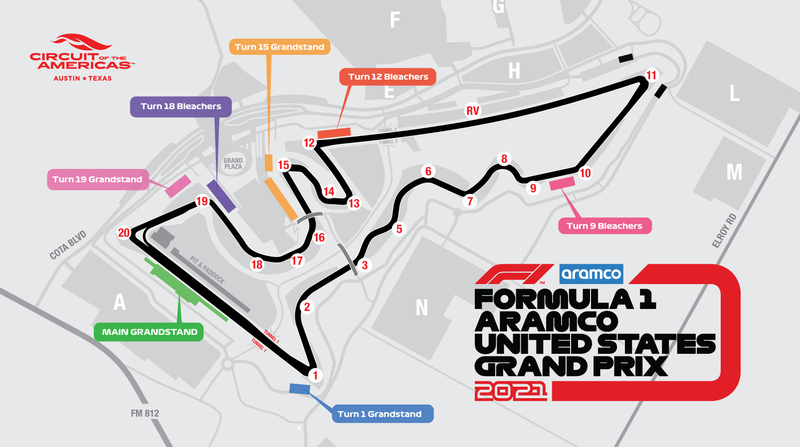 The Circuit of The Americas (COTA) is the first purpose-built F1 facility in the US designed for any and all classes of racing. Its signature element is a 5.5-kilometre (3.4-mile) Grand Prix circuit, located southeast of the Texan capital, and designed by Hermann Tilke in collaboration with American architectural firm HKS. The most significant section might be the run from the start-finish line up a steep incline to an almost blind hairpin. Turns Three through Six look not dissimilar to Silverstone's high-speed Maggotts/Becketts; Turns 12 through 15 give a nod to Hockenheim's stadium section; and Turns 16 through 18 mirror the famous, multi-apex Turn Eight at Istanbul Park. Very special is the grand plaza with its 70 metres high tower. From the tower´s viewing platform you have a great view over the Circuit of the Americas and a panoramic view to Austin.